Five Shadows » Blog Archive » One Monthly Goal – December Finish! « A Week of Celebrations! One Monthly Goal – December Finish! 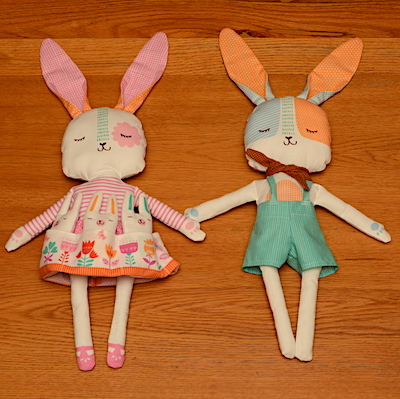 Grand daughter loved her little bunny family with the babies in the pockets of Mama bunny’s skirt. I tell you, turning those skinny arms & legs on Mama and Papa was a real chore. And then the bow tie beat me, so I improvised and made a bandana for Papa instead of the bow tie. We celebrated Christmas with our adult children on Christmas Eve by attending church with my son’s family. In the evening we all gathered at my daughter’s home and exchanged gifts. We spent Christmas day at my son’s home. When hubs and I arrived our grand daughter had all her dollies lined up in her bed room on the new quilt I had made for her and the bunny family was included among the dollies. It was so nice to see her playing with them. The quilt for grand baby number 2 was all pieced before hubs and I left on our trip. We came home after Christmas to a house at 32ºF/0ºC! The furnace was not working! 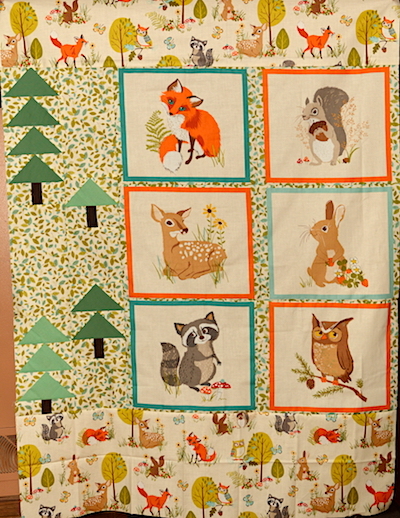 I just could not sew in a house that cold, so once the furnace was repaired, grocery shopping done, laundry from our trip caught up, I had just 3 days to sandwich, quilt, & bind the Forest Fellows quilt top to reach the second part of my OMG for December. And quilted and bound. I’m so pleased that I will have this quilt ready to present to my grand baby when we get that call that he has arrived! I’m linking to One Monthly Goal. Be sure to go visit and see what all the other quilters have completed this busy month of December! This entry was posted on Saturday, December 30th, 2017 at 21:22	and is filed under Family, Quilting. You can follow any responses to this entry through the RSS 2.0 feed. You can skip to the end and leave a response. Pinging is currently not allowed. 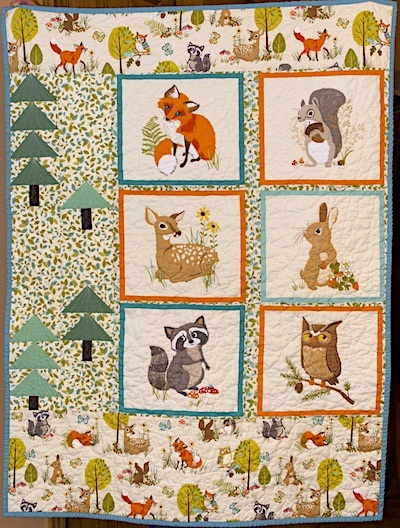 Forest Fellows, perfect for a wee fellow.0 Celsius, a tad cold for anything, far less quilting. Happy New Year, well done to get the quilt finished ,and the bunnies, what a delight to know they are well loved. Such a cute quilt. Thanks for linking up with Elm Street Quilts One Monthly Goal and congrats on your finish.